The Rev. K. W. H. Felstead is undoubtedly the statistician of the Exercise, and his "Points from Peals" articles, which appear in this journal from time to time, are most helpful and interesting. He has a flair for collecting data and has built up a monumental record of about 110,000 peals, and the towers in which they were rung. His card index system must be a most efficient one - and a mine of information. He has willed it to the Central Council, but it is to be hoped that it will be a long time before this body comes into possession! Mr. Felstead is convener of the Methods Committee, and a few years ago this committee produced a tremendous report to the Council, which revealed that long and arduous work had been done. It is doubtful whether the recent report of the Sunday Service Ringing Survey Committee was so long. Certainly the Council and the Exercise have cause to be grateful to him and his committee for the very efficient way they did their job. Mr. Felstead is a very popular figure at Council meetings, and after the main meeting, when all can relax, he is to be seen as the life and soul of the party. He is a good musician and the possessor of a good voice. Although he first learned to ring at Beighton, Derbyshire, about 1934, he did not become very active until he moved to Southampton. He was a contemporary of Paul Taylor, at Sheffield University, and did a little ringing at Handsworth, Sheffield. When he arrived at Southampton, it was not long before George Williams took him in hand, and Mr. Felstead's regret is that he never rang a peal with this wonderful man. His first peal was rung on Easter Monday, 1945, and being a busy parson he has not had the time to build up a large peal total. What he has done, however, is to go for variety, and out of his total of 74 peals, 54 have been on 10 or more bells. He has rung 11 different Surprise Royal methods, and the 20 peals rung on 6 and 8 bells are in 14 different methods. He took part in a peal of 6,400 Cambridge Major, with tenors together and 6th place bob, and a peal of Spliced Surprise Royal in four methods. The other peals of Surprise Royal include several methods rung for the first time. 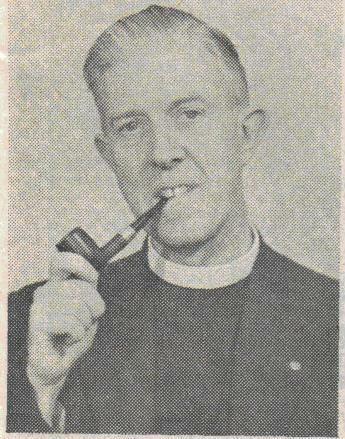 As Vicar of the important Church of St. Michael. Southampton, he is unquestionably a very busy man - but like all busy men he can always find time to do a little more for our benefit, and the Exercise will always be grateful to him not only for his useful work, but because he inspired the augmentation, from 8 to 10 bells, at St. Michael's, which is a first class ring.